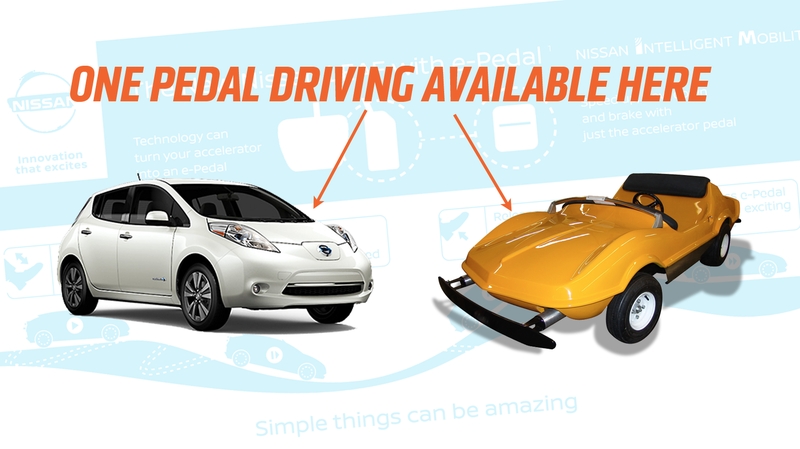 Nissan’s upcoming next-gen Leaf will introduce a new feature called the e-Pedal, which will allow for a single pedal to be used for accelleration and braking, allowing people to drive with just one pedal. Many people will already be familiar with this method, as it’s just about like driving one of the Autopia cars at Disneyland. With the flip of a switch, the technology turns your accelerator into an e-Pedal, allowing drivers to accelerate, decelerate and stop using just the e-Pedal*. e-Pedal technology is the world’s first one-pedal operation that allows drivers to bring the car to a complete stop even on hills, stay in position, and resume driving instantly. Really, it’s not all that different than how you’d drive most electric cars that are using regenerative coasting to recover energy. All electric cars that use regen experience noticeable wheel drag when coasting, which slows the car down significantly. Anyone who has ever ridden in one of the Autopia cars in Tomorrowland at Disneyland or Disneyworld (or any number of other amusement parks with similar driving-rides) will be familiar with this system, as that’s pretty much the same way the one-pedal driving in those Autopia cars work, except they’re powered by noisy little go-kart engines and not a bunch of expensive electric drivetrain stuff. So, if you’ve been longing for the Autopia driving experience in the real world, it sounds like you should get yourself a new Leaf when they come out this September. Oh, but you still can’t ram into the back of other people and then just laugh at them. Sorry.